First up, the first of TWO KLMS Charts featured this week. Neat to see Bob Dylan's "instrumental" hit "Wigwam", falling from #12 to #18, right next to Johnny Cash's latest cross-over hit "Sunday Morning Comin' Down" (another Kris Kristofferson tune). I've always been partial to the Mashmakhan record "As The Years Go By" ... and it's nice to see the Grand Funk Railroad classic "Closer To Home" working its way up the chart (up nine places this week from #37 to #28). John Lennon's future back-up group Elephant's Memory is at #34 with their best-known hit, "Mongoose" ... and the incredibly beautiful Linda Ronstadt track "Long Long Time" moves up a notch from #40 to #39. 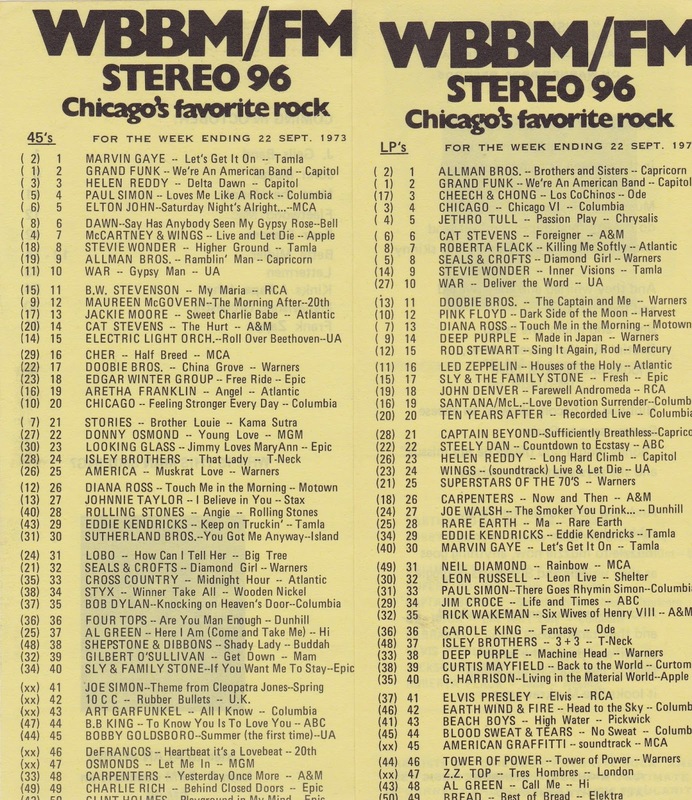 Jumping ahead to 1973, we find Grand Funk on this Chicagoland chart, too ... they've just vacated the #1 spot with their latest hit, "We're An American Band". You'll find Bob Dylan back on this chart, too, with his latest, "Knockin' On Heaven's Door". Surprises this week? A few ... how about "Sweet Charlie Babe" by Jackie Moore at #13. (I don't think I could hum a line from this one without putting the record on first ... so let's do that!) This record didn't even make Billboard's Top 40. And look at that Styx record at #34 from back when they were still on the Wooden Nickel record label! We've got some early 10cc with "Rubber Bullets", debuting at #42 this week ... followed closely behind by that love-it-or-hate-it Bobby Goldsboro track "Summer (The First Time)". 1974 brings us back to KLMS with this chart, also dated September 20th. Very little in the way of big surprises on this chart ... although it IS kinda funny to see Lynyrd Skynyrd, Joni Mitchell and Cheech and Chong falling back-to-back-to-back on the countdown. (Wonder what THAT sounded like back in '74?!?!) Let's find out, shall we??? And talk about unusual rankings ... bubblegum was all the rage back in '68 ... so it's not at all surprising to see "Down At Lulu's" by The Ohio Express and "1,2,3 Red Light" by The 1910 Fruitgum Company back-to-back on the chart at #4 and #5 ... but look what follows it at #6!!! In fact their Top Ten Albums list this week shows some pretty heavy programming ... besides The Iron Butterfly, they've ranked the latest offerings from Cream, Big Brother and the Holding Company, The Doors, Jefferson Airplane, Canned Heat and Steppenwolf ... that's some pretty heavy stuff for a station ranking a couple of Top Five bubblegum hits!!! Another one I still play all the time is "The Snake" by Al Wilson ... and check this out ... last week we featured a 1968 chart that showed Aretha Franklin's version of "I Say A Little Prayer" at #1 ... and this week on KXOK that record is just first premiering on the chart at #29! This somewhat "spread out" popularity caused many a hit record to chart far lower than it should have back in the day ... and why records that did VERY well locally and were a big part of your lives growing up often seem to fall short of your memories on the national charts. THE ANIMALS are #1 again this week (for the third week in a row) on The Billboard Hot 100 Pop Singles Chart. New in The Top Ten is DO WAH DIDDY DIDDY by MANFRED MANN, up from #31 to #9. THE DAVE CLARK FIVE also have the #8 Hit with BECAUSE. A HARD DAY'S NIGHT by THE BEATLES falls to #12. IT'S ALL OVER NOW by THE ROLLING STONES is at #26. THE BEATLES are also holding on to the #28 spot with AND I LOVE HER (down from #12 the week before) and then we've got three British hits in a row at numbers 30, 31 and 32 with A SUMMER SONG by CHAD AND JEREMY, HOW DO YOU DO IT by GERRY AND THE PACEMAKERS and MATCHBOX by THE BEATLES respectively. THE SEARCHERS are at #35 with SOME DAY WE'RE GONNA LOVE AGAIN, BILLY J. KRAMER AND THE DAKOTAS are holding down the #37 spot with FROM A WINDOW … and that's it for British Artists in The Top 40. Bringing up the rear: SLOW DOWN by THE BEATLES (#43), IF I FELL (also by THE BEATLES) at #55, RINGO'S THEME (which is actually THIS BOY by THE BEATLES, done as an instrumental by their producer GEORGE MARTIN), at #57, GONNA SEND YOU BACK TO WALKER by THE ANIMALS (#65), TOBACCO ROAD (up to #72 from #90 for THE NASHVILLE TEENS), I WOULDN'T TRADE YOU FOR THE WORLD by THE BACHELORS (#80), IT'S FOR YOU (a LENNON-McCARTNEY tune recorded by CILLA BLACK) at #84, first week on the chart, HAVE I THE RIGHT by THE HONEYCOMBS, brand new at #90 (and a GREAT overlooked track, by the way, that eventually topped the chart here in Chicago) and SOMEONE SOMEONE by BRIAN POOLE at #97. This week THE ANIMALS fall to the #2 spot after just one week on top with THE HOUSE OF THE RISING SUN. That's because they've got some VERY stiff competition in the way of OH, PRETTY WOMAN by ROY ORBISON, which will top the chart for the next five consecutive weeks, and LAST KISS by J. FRANK WILSON AND THE CAVALIERS (#3 this week). DO WAH DIDDY DIDDY by MANFRED MANN is at #5, followed by A SUMMER SONG by CHAD AND JEREMY at #6, BECAUSE by THE DAVE CLARK FIVE at #7 and A HARD DAY'S NIGHT by THE BEATLES at #10. THE ROLLING STONES hold down the #17 spot with IT'S ALL OVER NOW, followed by FROM A WINDOW by BILLY J. KRAMER AND THE DAKOTAS at #20, SOME DAY WE'RE GONNA LOVE AGAIN by THE SEARCHERS at #26 and MATCHBOX / SLOW DOWN by THE BEATLES at #30. We've been talking about this one for nearly a month now ... I am SO disappointed that this show isn't coming to Chicago! And then, right before it started, we got some sad news that due to more heart problems, Gerry Marsden (and the Pacemakers) would NOT be able to perform ... he's one of my favorites from The British Invasion ... but doctors forbid him from traveling to The States ... so former Swinging Blue Jean / Hollie Terry Sylvester stepped in to fill his spot because, as they say, the show must go on. “History of Rock ‘n’ Roll” engineer Peter Gould and I had a great time backstage at the Ridgefield Playhouse in Ridgefield, CT, interviewing the stars of The British Invasion 50th Anniversary Tour, which kicked off here a couple of nights ago. Mike Pinder, lead singer of The Searchers, was there, not only delighting the packed house with rock classics like “Needles and Pins” and “Love Potion #9” but, in a much quieter back office, sharing with Peter and I the inside stories behind the songs and saga of his group from its start in 1959 on through to the present. Also on hand: Terry Sylvester, who first gained fame with The Swingin’ Blue Jeans and later, far more spectacularly, with The Hollies (“He Ain’t Heavy, He’s My Brother,” “The Air That I Breathe,” etc.) Terry’s story behind what I consider one of the ten best rock records ever made (“Long Cool Woman In A Black Dress”) was particularly compelling, in that that track was intended as the throwaway B side of single to be released only in Germany. Quite by accident, one German DJ broadcast the “wrong side” of the 45 – sparking an avalanche of telephone requests to ‘play that song again.” That’s how what became The Hollies’ all-time biggest seller got launched. While Chad & Jeremy were both listed on the bill, only Chad Stuart appeared as Jeremy’s international flight had been delayed. Chad, though, sat down and spoke to us and told about the writing and production of “Yesterday’s Gone,” “A Summer Song” and their other key mid-‘60s hits. One disappointment: Gerry & the Pacemakers’ Gerry Marsden had been forced to cancel at the last minute due to heart surgery. Peter & Gordon’s Peter Asher, who acted as MC, explained that Gerry had just emerged from the hospital and was resting comfortably at home but could not fly yet as his doctors forbid it. While it would have been great to see and hear Gerry’s shimmering vocals on hits like “Ferry Cross The Mersey” and “You’ll Never Walk Alone,” the crowd understood and collectively wished Gerry a speedy recovery. Filling in for this date only, Mr. Asher sang some of his Peter & Gordon hits with others as his original partner, Gordon Waller, had passed away in 2009. Backstage Peter talked to us about his Peter & Gordon days as well as his later work as a Grammy-winning producer, crafting albums for James Taylor, Linda Ronstadt (his favorite female singer) and others. Our plan is to shortly work highlights from those interviews into new episodes of "The History of Rock 'n' Roll," which is heard three times a day around the world on rewoundradio.com and supernovaradio.co. Come see for yourself what all the excitement is all about as this band of British Invasion stars continues to tour America, presenting live versions of some of the most timeless rock classics ever recorded. The British Invasion 50th Anniversary Tour is scheduled for a few more shows. The next will be Friday, September 19th in Los Angeles (Beverly Hills), Saturday, September 20th in Valley Center, CA. and Sunday, September 21st in Saratoga, CA. I was fortunate enough to catch the first date of the most recent "British Invasion 50th Anniversary Tour" at the Ridgefield Playhouse in Connecticut last night. A fun show -- and nearly three hours long!A couple of snags made the lineup a bit different from what had been advertised. Headliner Gerry Marsden had to withdraw due to what was described as heart surgery. Apparently, he's recovering in England, but his doctors nixed his participation in the tour. [Please, no "Gerry and his pacemaker" jokes.] So he was replaced by Terry Sylvester, former member of the Hollies (1969-81) and, before that, of the Swinging Blue Jeans (1966-69). Chad and Jeremy's act was bisected by some passport / visa hassles involving Jeremy Clyde, who had to stay in London until the mess is straightened out. Jeremy communicated with the show (and the audience) via Skype, live from his apartment and in his PJs, it being past midnight in England; his comments were broadcast on the huge multimedia screen at the rear of the stage.Jeremy's being unable to appear did lead to a first (?) of sorts: duets involving Chad Stuart and Peter Asher, formerly of Peter and Gordon. Peter took Jeremy's parts in such classics as "A Summer Song" and "Yesterday's Gone." Peter also acted as the show's emcee and performed a generous handful of Peter and Gordon's big hits, from "A World Without Love" to "Lady Godiva. "Terry opened the show with Hollies songs (in fact mostly from before he joined the band, however) and a couple from his Swinging Blue Jeans days, including "You're No Good." He was followed by Mike Pender, late of the Searchers, who did a handful of that band's greatest; he looked to be in great shape and his guitar playing is still superb. Then came Chad and Jeremy -- or, rather, Chad and Peter -- followed by Peter and the backup band doing his hits, the parts of the late Gordon Waller being handled by multitalented keyboardist, guitarist, and vocalist Jeff Ross, who was with the touring version of Badfinger in the mid-1980s. (This British Invasion tour's drummer is the excellent Liberty DeVitto, best known for his work with Billy Joel. )After an intermission, Billy J. Kramer took the stage to reprise all his hits and some new material, including "Liverpool With Love," which is not only about his hometown but about the fact that his (and the Beatles') former manager Brian Epstein has this year been inducted in the Rock and Roll Hall of Fame. For quite some time, Billy has been banging the drum for Brian's admission to the Hall of Fame, and at last it's a reality. Billy had plenty of energy, but he could stand to drop a few pounds; the multimedia images of himself 50 years ago made it all too evident that he is no longer the fresh-faced 20-year-old he was when Brian managed him. Denny Laine, who looked and acted way younger than his 69 years, concluded the show with a scant three songs, including "Go Now" from his Moody Blues days. (For my money, I would have preferred two or three fewer from Billy J. and two or three more from Denny.) But then the whole crew got together for the finale, a lengthy singalong of "Band on the Run" from Denny's time as a member of Wings -- altogether a fitting end to an enjoyable evening.Not necessarily in terms of the music, but purely for being likeable, my favorite of the show was Peter Asher, who evidently is very fond of all his British Invasion compatriots and was the perfect person to introduce each act and tell a few when-we-were-fab stories, as well as dipping into the Peter & Gordon songbook for some favorites. Plenty gear, in my opinion. Ridgefield, CT is one of those places that is beautiful, but rather inaccessible due to trees, rivers, and other natural road-blocks. It is 30 minutes away from me as the crow flies, or 60 minutes by car ... if traffic is good. The cities of Manchester and Liverpool are probably much easier to get to, but Ridgefield is where the 50th anniversary of The British Invasion began. The day before, I received confirmation from the theatre that Gerry Marsden will not be able to join the tour. They also offer me, and every ticket holder that night, a way to get a free glass of wine or draft beer before the show. Now ... they have never done that before, sooooooo ... I am thinking that this is either something new ... OR ... they feel bad because Gerry can't make it ... OR AGAIN ... they feel sorry for things I don't even know about yet. Hmmmmmm. Terry Sylvester opens the show and there are vintage videos and pictures projected of 60's dancers and Terry a 'couple' of decades ago. I spot stage crew in the wings playing air guitar. Yeah! It's gonna be fun. Since I am taking notes in a pitch black theatre, I need you to excuse me, as I cannot read all my notes now. If I miss a song (and I will), it is only because my writing is illegible. Terry's section was a composite of Swinging Blue Jeans and The Hollies. Here is what I can read: Bus Stop, Carrie Anne, You're No Good, and Hippy Hippy Shake. At intermission I heard, "So Terry missed a couple of notes. So what? He was still great!" There is a moment when it hits you ... these are THE people! These are THE ONES who made it happen! They are only a few feet away from me, and I appreciate them so much more than I did at 12 years of age. I have seen Terry perform before so maybe it hit me during Mike Pender's set. Doesn't matter, here comes Mike. Spry, running and rocking around the stage with a guitar slung over his shoulder. Comment I heard? "Oh, Mike was spot on!" Mike Pender remarked that he has not been invited to the US very often over the 50 years, and he would LOVE to visit more. So (says he) CALL THOSE THEATRES AND GET ME BACK HERE MORE OFTEN! Here at Forgotten Hits, that is preaching to the choir, but it is a very good idea for all of us to be reminded of that. Again, vintage pictures of The Searchers appear behind him while he sings and I think, "Oh look at that! No! Look at him! Oh look at that! No! I want to look at him!" Grrrrrrr!! I am in the second row, but my angle forces me to choose one or the other. As I watch the video, I ask myself the question, "Do you wish they were still that age? The age of the pictures we relate to?" I answer, "No. They would be way younger than me, and that would be creepy." (C'mon Shelley! What did he sing?) Sweets For My Sweet, Don't Throw Your Love Away, Sugar & Spice (not a fave of Mike's AT ALL, but we bought it here in the US), Every Time That You Walk in the Room, Needles and Pins, and Love Potion #9. Quoting Mike, "Take me for what I'm worth." It was worth a lot to me. Now while the stage is reset, we watch videos of Gerry Marsden and The Pacemakers. They are from a live show hosted by Brian Epstein so it is great to see him large and back on the screen. Peter Asher has given us the information that Gerry is out of hospital and doing well. But because of his prior major health issues, his doctor will not let him fly. God Bless You, Gerry. We missed you. Wait now ... there is a Skype screen up and it has an icon that says 'Jeremy Clyde', but there is no Jeremy Clyde visible. But isn't he talking? I mean I hear his voice, but what is going on? Short answer after I figure it out. Skype SNAFU. Jeremy Clyde IS supposed to be on the screen explaining that he is in London in his pajamas waiting for his VISA to be found. He is packed, but can't leave the UK. He says his VISA has the notation: Person of Exceptional Ability. Which makes him wonder how someone with less than that category would be treated. I sit baffled. Just what is going to happen now? I'll tell you. Out comes Chad Stuart, in a Canadian Tuxedo, (jeans top to bottom) and Peter Asher to perform as a MIXED DOUBLES. As Peter says, the two short guys with funny looking glasses will be performing together. I am excited, no disappointed, no excited, well absolutely disappointed; but a CHAD AND PETER concert? Never been to one. Maybe no one has. This is a first! I'm in!! (Yes, I still missed you Jeremy). I love Chad and Jeremy. They are so down to earth and humble. I have fond memories of the time my daughter and I found my son sitting and having coffee with Chad while they discussed politics. We had briefly spoken with Jeremy the night before as he was hobbling on a broken ankle back to his hotel room. He still stopped to speak with us. So we start with the first song Chad ever wrote, Yesterday's Gone. Peter has a stand in front of him, probably holding lyrics. You know, as many times as you hear a song, if someone says YOU SING IT, it can cause an instant memory loss. Next up is Summer Song with a false band beginning that makes Chad banter, "What's wrong with you? I haven't started yet?" Open laughter from the audience. OH LOOK!! Skype is working and there is Jeremy Clyde up on the screen and yes, he is in his pajamas. He listens to Chad and Peter, and when they are finished, addresses us in the audience for awhile, ending with the introduction: "He has played Me, and now he will play Himself." The tables have turned. Chad pulls out a paper with lyrics on it, professes fear of screwing up, and they begin with I Go to Pieces. I may never see this combo again ... well, definitely not in this fashion anyway. Fantastic applause as Chad Stuart leaves the stage and Peter Asher continues with Nobody I Know, I Don't Want to See You Again (which they sang on The Ed Sullivan Show), Lady Godiva (the song that snooty Peter first declined) and ending with World Without Love. "According to English Music Hall tradition, you should end with your biggest and make it a sing-along." The videos behind him not only included Peter, Gordon and Peter's sister Jane; but also Paul McCartney who was a great part of the success of Peter and Gordon. A stairway has been placed in front of the stage giving it access to the audience. I can tell you who will be next: Billy J Kramer. I know he enjoys visiting us up-close and personally. By the way, I recognize a couple of the back-up musicians. Billy Joel's drummer Liberty DeVitto is here and Peter Asher's friend Jeffrey Alan Ross is on keyboards. I believe Jeffrey is the musical director for this tour. Billy, who was managed by Brian Epstein and is introduced as the top solo artist of The British Invasion, begins with the title track from his newest cd: I Won the Fight. Yeah, he did. He won the fight of moving out of the trenches he began in and has continued to fight to his current days of successes. His next piece: I'll Keep You Satisfied, has not left my head yet and I seem to be waking up to it each day. Actually, I am finding that to be the case with so many of the songs from this night. Randomly something like 'Laaaady GoDIva' will fly into my thoughts and I smile or actually giggle. Just confirmation on how much the music means to me. Billy's set is thankfully lengthy, as I really don't ever want to leave this place and time, however much I know I eventually must. So he willingly performs From A Window (Lennon / McCartney); Do You Want to Know a Secret; I Call Your Name; and Trains, Boats, Planes. Then he gives us an in-audience rendition of another new song: To Liverpool With Love. I heard this song first two years ago at The Fest For Beatles Fans. The verse about 'why isn't Brian Epstein in the Rock and Roll Hall of Fame?' has thankfully been forced to change since this year he was inducted. (ok ... one in a row right for the R&R ... ok, maybe two since they also inducted Andrew Oldham). Billy says the next song is one of his favorites and surprises me by singing Little Children. The surprise is that I have always loved that Kramer song and yet most people select a different one as their fave memory. So Billy likes it too huh? hmmmmmm. Of course he had to do Bad To Me, the song John Lennon thought perfect for him. Billy adds the story that he asked for I Want to Hold Your Hand as well and was told, "No. We're going to do that one." What would have happened if John had said Yes? Sorry Billy, but for you, The Beatles, and the world, I think it worked out best this way. The final song is The Sun Ain't Gonna Shine Anymore. OH WOW! If you have not heard that live, you have not heard it! Denny Laine!! Here he is and he is Denny Laine!! Denny Laine is probably one of the few people I could pass on the street and know who he was without having seen him recently. He talks about the American R&B influence that the UK used in The British Invasion. He mentions House of the Rising Sun and others that came from our past and were updated and restored during the 60's. This is a fact not lost on my students when we hit the 60's and really ties into the beginnings of utilizing ALL the music genres in some fashion during this decade. For my friend Dave Zane and the rest of The Buckinghams, I am pleased to tell you he begins with I Go Crazy! This concert is just filled with Oh Wow moments. I have to tell you now that the only two words I can read in my next notes are 'Don't Mind'. Sorry Denny, we are moving on. His third and last song is GO NOW! hahahahaha ... good one! However, we DON'T WANT TO GO ... NOW OR EVER! Everyone is on their feet! Everyone is clapping! No one sits down! No one stops clapping! The stage is dark. We won't accept this! (Of course. we were pretty sure it wasn't over) AND IT ISN'T!!! EVERYONE RETURNS TO SING ... BAND ON THE RUN! The audience stays on their feet and even when it is clear that the music will stop, we stand clapping watching Billy J come down the steps again and blast his way through the audience to the lobby. Other artists pick easier ways and Chad Stuart remains trapped on-stage surrounded by fans. WHEW!! I'm exhausted! I purchased merchandise during intermission and seeing the crowds engulfing all the performers at the merchandise tables and knowing I must be up at 6:00 AM (which I missed by the way, and had 30 minutes to shower, dress and get to school) I make an 'oh crap!' decision to leave for my hour drive home. This is the tour of a lifetime. This premier concert had Chad and Peter, no Jeremy. The next concert will have Chad, no Peter nor Jeremy. In a few, it will be Chad and Jeremy, no Peter. Followed by Chad and Jeremy and Peter Asher. See what I mean? Not by plan, but by function, each of these concerts is an individual. No two possibly alike. I know! No two concerts are ever alike. Absolutely true. But by mere luck of the draw, each person will be able to experience a celebration of a special time in a unique setting. My mind is now playing Go Now, so I will. Forgotten Hits salutes and remembers The British Invasion every Friday this year in our "50 Years Ago This Weekend" feature. Join us here tomorrow ... and don't miss a single one! (Scroll back to catch up on any that you may have missed along the way!) We LOVE this music ... and would have loved to have been at this show. Hopefully, if these shows prove to be a success, more dates (and/or artists) will be added for a return trip in the not-too-distant future. 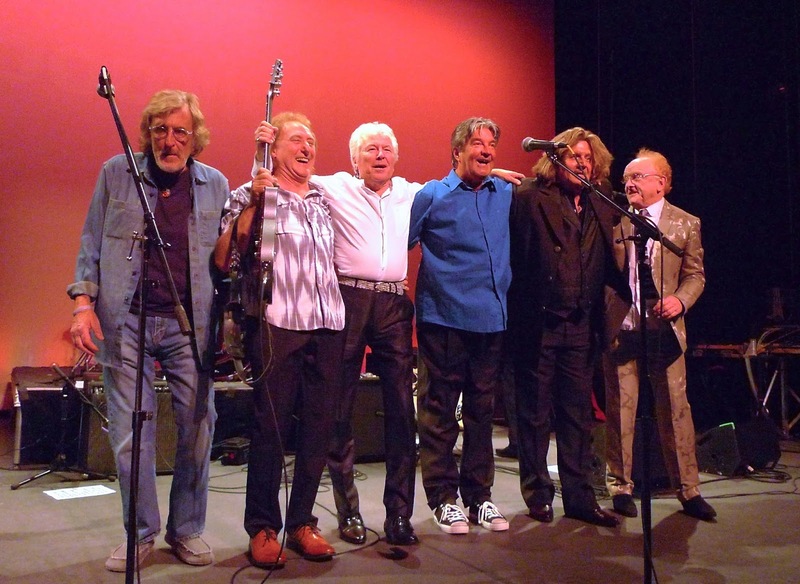 Left to Right: Chad Stuart, Denny Laine, Mike Pender, Terry Sylvester, Billy J. Kramer and last, but surely not least, Peter Asher.